You might never be good enough for the PGA, but mini golf in Florida is a sport that anyone can enjoy. Every mini golf course is unique, with each one hiding its share of tricks and challenges. That, paired with the kitschy themes and vibrant designs, makes for a memorable time. 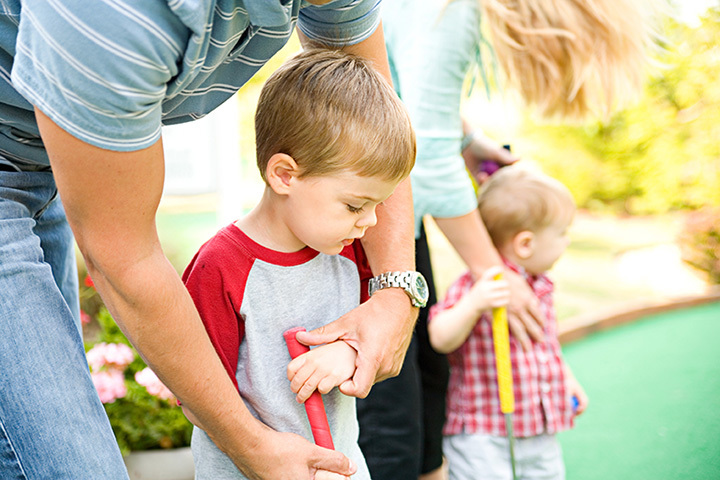 Bring the whole family for fun on these 10 best mini golf courses in Florida. It’s no surprise that Disney would offer the most magical mini golfing experience in Florida. Their “Fantasia”-themed course is brimming with whimsical scenes and beautiful landscaping that will make you want to play again and again. The other course is just like a regular golf course, only miniaturized—you get the best of water features, sand traps, bunkers, and putting greens all rolled into one. Tucked away in Universal’s City Walk, Hollywood Drive In Golf offers two unique courses that reflect the 1950s-era Hollywood movie scene. Vintage movie scenes from sci-fi and horror films take the spotlight, but you and your family will be center stage as you make your way through these fun, original challenges. You’ve never experience mini golf like this. With five locations in the state, this pirate-themed mini golf adventure comes with a unique twist. Not only do you get to feed your appetite for fun, you also get to feed live alligators that live at the course! Make your way through caves, a pirate ship, waterfalls, and more to reach the final treasure. Don’t let the name scare you off—this place is way more fun than terrifying! Indoor blacklight mini golf creates a fantastically fun adventure that’s vibrant, chilling, and memorable. Kids of all ages will love the whimsical monster theme and the giant arcade to celebrate a great golf game. Find locations in Coral Springs, Miramar, and New Port Richey. With eight locations in Florida, Congo River’s jungle theme create the perfect setting for mini golf in Florida. Set out for adventure while you explore the deepest jungles of Africa as you make your way through 18 holes of fun. And make sure you visit the live alligators on site—they’re bigger than you expect! This medieval mini golf journey is fit for royalty. Castles, knights, and moats with bridges dot the landscape that sends you straight back in time. It’s a magical experience, and best of all, you don’t have to slay a dragon to emerge the victor. There are two locations in Bradenton Beach, and you’ll want to visit them both. This course is nothing if not unique, offering misters to keep you cool, a beautifully landscaped koi pond, and no shortage of fun and excitement. One game here and you’ll be hooked. You’ve got your pick of two masterfully crafted courses for a total of 36 holes. This little city oasis offers something for kids and adults alike. Start by teeing off on one of their beautiful courses, then wrap up the game with a frosty beer, cocktail, or sit-down meal. Kids love the scavenger hunts and the fun fairytale statues found throughout the area. Paying homage to the hit TV show of decades past, this western mining-themed mini golf course is a true gem. Guests love the course’s cleanliness and discounts on the second round. They also offer an unlimited golf deal that lets you play all day for one low price! This place isn’t your typical Florida Keys hangout. From mini golf to food and drinks to live music and more, every day will feel like a vacation. This lush garden of a mini golf course is picture perfect, and it’s the only one of its kind in town.